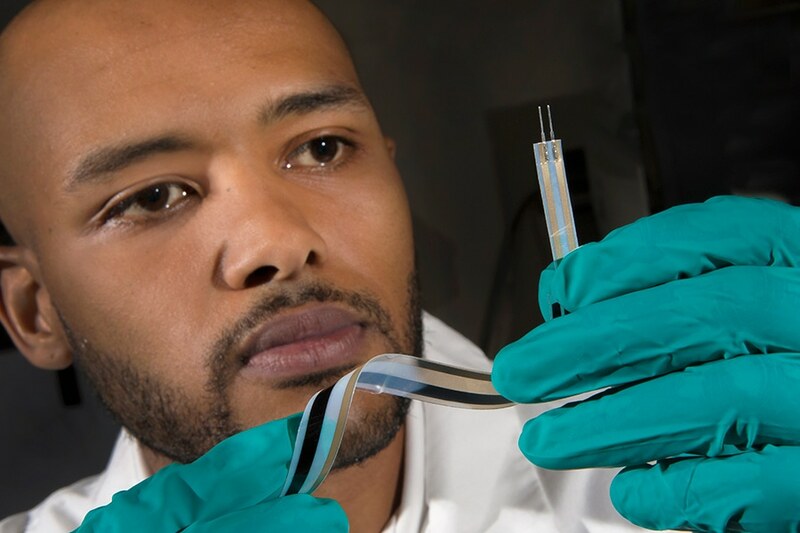 A team of researchers from the FAMU-FSU College of Engineering have created a group of revolutionary motion sensors that could pave the way for a near future of ubiquitous, completely integrated and economical wearable technology. Engineers from FSU’s High-Performance Materials Institute, partnered with researchers from the Institut National des Sciences Appliquées in Lyon, France, explain in a paper published in the journal Materials and Design, the impressive properties and cost-effective manufacturing process of an innovative series of motion sensors made using buckypaper — razor thin, flexible sheets of pure, remarkably durable carbon nanotubes. These new buckypaper sensors signify a noticeable improvement on present industry standards, with a majority of sensors being either too crude or too inflexible to reliably monitor multifaceted structures like the human body. Current technology is not designed for that, for sensor technology, you need it to be flexible, you need it to be affordable and you need it to be scalable. This new technology is versatile and the sensors are affordable to print. It’s a big innovation that presents many possibilities down the road. Richard Liang, director of the High-Performance Materials Institute and professor at the FAMU-FSU College of Engineering. At this stage, promising applications for the printable buckypaper sensors are restricted only by the extent of researchers’ imaginations. The low-profile design could be combined into shoes to track step count, bed sheets to monitor quality of sleep, and posture or workout clothes to measure intensity of exercise. Researchers also predict potential applications further than the realm of wearable technology. In the field of soft robotics, the material could enable progress in the manufacture of responsive, self-correcting artificial muscles. Furthermore, the scalable sensors signify another step toward the long-anticipated future of an “internet of things,” where nearly all of an individual’s computers, garments, devices, furniture and appliances are digitally connected to easily exchange data in the cloud. Most projects don’t have this many possible applications, this material could be used in structural health monitoring, wearable technology and everything in between. I’m excited because this is something that can affect a lot of people in their everyday lives. Joshua DeGraff, the study’s lead author, doctoral candidate. The innovative sensor structure integrates a strip of seven micron-thin buckypaper with silver ink electrodes printed from a standard, commercially available ink-jet printer. The outcome is a kind of ideal Goldilocks sensor: not as insensitive as regular, flexible metallic sensors, but not as inflexible or cumbersome as widespread, more sensitive semi-conductor sensors. The wearable buckypaper sensors are a perfect marriage of these competing abilities. They are seamless, flexible, and sensitive to subtle strains and movements. As development of the printable sensor technology advances, the researchers anticipate improvement regarding the already incredible thinness of the material so that it can be combined into comfortable and non-restrictive clothing. Further testing on intricate model structures is essential to guarantee the material’s ability to adapt to the variable crevices and curves of the human body. While the technology might not be equipped for primetime as yet, the researchers are energized by its hopeful future. As engineering professors, we want to see the things we create in the lab become successful products, we’re not quite there yet, but this is an important step. Consumers want great quality and affordable prices, and this material provides both of those things. The research received support from the Florida Education Fund’s McKnight Doctoral Fellowship program, the National Science Foundation Scalable Nanomanufacturing Program and the Région Auvergne Rhône-Alpes “CMIRA Accueil Doc” fellowship program.